Today’s weather focus will be on ice accretion expected to occur as warm air surges north aloft, but gets hung up at the surface. One measure of how well a cold airmass is dug in is what’s happening just offshore, at the buoys that typically escape most of the cold air damming. If the buoys are experiencing the same CAD that onshore locations are, you know the cold airmass is strong and well fortified. This morning at the Isle of Shoals buoy SE of Portsmouth reported a north wind of 5 kts with a temperature of 27.5 degrees. This cold air isn’t going anywhere fast! Swiss Super HD model forecasts show cold air remaining entrenched through this morning. I think it has a decent handle on the forecast up until around noon, when it begins to warm much of the area above freezing. I think the temperature map will look a lot like the one above for much of the day. Most folks outside of the western slopes of the mountains, the Midcoast, and the NH Seacoast will stay below freezing for most if not all of this afternoon as cold air is notorious for its staying power. This evening, precipitation will end as the storm moves northeast. Cold air will flood south as this process unfolds, with everyone returning below freezing by tomorrow morning. As the cold air remains locked in at the surface, warm air will be streaming in aloft. This will change any leftover snow showers to freezing rain this morning. Freezing rain will be the dominant precipitation type throughout the day as our very shallow cold air layer hangs on near the surface. 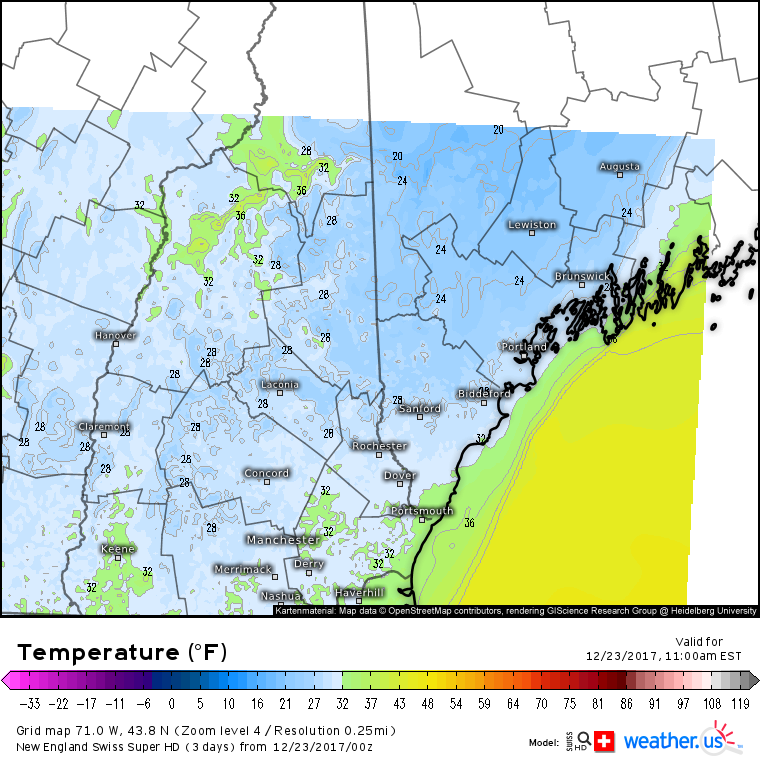 Ice accretion of between a quarter and a half inch is expected south of the mountains and away from the midcoast. This is more than enough to make roads slick, and just enough to introduce the threat for power outages, though widespread damage to the power grid is not anticipated. Freezing rain, coastal rain, and mountain sleet/snow will taper off this evening. I did a full analysis of this storm and some of the science behind the setup as well as behind freezing rain in general for yesterday morning’s weather.us blog. Check it out!